I did, in fact, have that belated birthday party I talked about having. I decided that since I celebrate Bethmas Eve, Bethmas, and Bething Day, it only makes sense that if I have a party after my actual birthday, it’s Orthodox Bethmas. The party was fantastic, if I do say so myself. I’m so lucky that I have so many wonderful friends and I love it that even though lots of my friends don’t know each other, everyone enjoys chatting and making new friends with my other friends. There’s also some of my friends that only know some of my other friends from having met at my various birthday parties over the years, so they get to catch up – lol! I also discovered that two of my very close friends, each of whom I have known for well over a decade, have never actually met each other! They seem to have just not had their paths cross before – even when they’ve both been able to make it to one of my parties, for example, one of them had come early and the other hadn’t come until later, after the other one had left. Rather than doing an elaborate house drink for my birthday party, which I often do because I love mixing cocktails, I decided to go with the simple Moscow Mule. This choice may have also been influenced by the fact that I had a bottle of ginger liqueur that I bought in Portland ages ago with the intention of using it to make Moscow Mules but hadn’t. At any rate, they were very popular. Dr. Dan, and his grad student, Nic, visited for a while. It was great to see them, as always (I only wished I could have spent more time hanging out!). They got to come to my birthday, which was awesome, and Dr. Dan even guest lectured in my class at the JI! I completely blew my weightlifting personal record (PR) that I set on my birthday out of the water. As you may recall, on my birthday, I back squatted 77.5 kg (171 lbs). By the time that particular program ended two weeks later, I back squatted 85 kg (187 lbs)! I also set PRs for trapbar deadlift (100 kg or 220 lbs!) and what I think are PRs for bench press (42.5 kg or 94 lbs) and barbell overhead press (26 kg or 57 lbs), but I’d have to look back at all my old programs to be sure. We had a full day planning meeting for the Canadian Evaluation Society BC chapter executive last weekend and I have to say, I’m really lucky to work with such a dedicated and creative group of people. We’ve got lots of exciting plans for this year! Work is crazy, as always. And that’s probably enough said about that! On Thursday, my friend Alicia took me to see a performance of Much Ado About Nothing by an all female cast at the Cultch. It was hilarious! I’ve never seen or read Much Ado About Nothing before, so it was fun to get to see it without knowing what was going to happen. All of the actors were brilliant and the venue is so intimate – it’s quite a different experience than seeing places up on a tradition stage in a big theatre. It’s running until Feb 16 – if you can, I highly recommend you go see it! How much better is it to weep at joy than to joy at weeping! Anyhoo, I guess this has been enough of a break for today – time to get back to my marking! Where does the time go? It seems like just yesterday we were celebrating Bethmas weekend, yet here it is 365 days since the last Bethmas Eve! Since Bethmas falls on Monday this year, I’ve decided to extend Bethmas celebrations for the whole week as having my birthday party before my birthday seemed too early in January. Celebrations start with a birthday lunch with coworkers1 and then dinner with some friends at New West’s hot new restaurant on my actual birthday and culminating with a Bethmas party next Saturday2. As for Bethmas Eve, it’s pretty low-key. This morning I’ve been doing such exciting things as checking in on the discussions in the online course I’m teaching, doing laundry, and finally taking down my Christmas tree. Though I do have a hockey game later, so the plan is to finish up all this being-a-responsible-adult stuff before then and officially kick off Bethmas Eve with hockey! w00t! I’m 35 Years and 365 Days Old – but I’m Not 36 Years Old Yet! 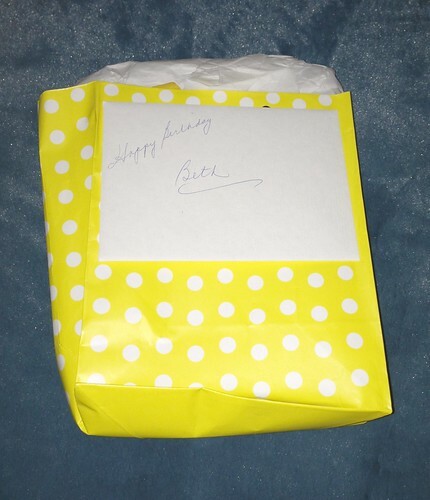 Being the frugal ladies that they are, my mom and my sister included my birthday card and my birthday present in the package that my mom mailed me for Christmas. And I have been waiting impatiently to open said card and said present since then. Soon, my precious. Soon I shall open you. I hope you are all having a joyous Bethmas Eve!